Google launched Chrome 27 beta today, bringing faster page loads and more HTML5 features to its already speedy browser. 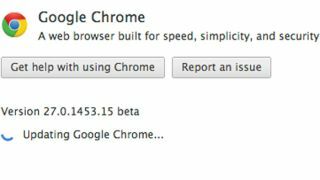 On average, the company said that Chrome 27 beta is now 5 percent faster due to changes in the browser's resource scheduler. "Starting with this release, the scheduler is more aggressive about using an idle connection," wrote Google software engineer Kinuko Yasuda on the official Chromium blog. "[It demotes] the priority of preloaded resources so that they don't interfere with critical assets." Chrome 27.0.1453.15 and its speedy 5 percent uptick in page loading is available for both desktops and Android devices through the browser's beta channel. Chrome 27 beta is also bringing more efficiency with HTML5 date and time input forms. "The month, week, and date types now feature a simple, elegant user interface on desktop versions of Chrome," wrote Yasuda. Behind-the-scenes, developers can use live audio as an input to the Web Audio API for extremely low-latency local audio manipulation and playback. "When combined with the recent hook up of Web Audio and WebRTC PeerConnection, it enables analysis and manipulation of the input signal to WebRTC," explained Yasuda. This desktop-only developer feature is joined by a Synch FileSystem API for offline storage when working with Chrome Packaged Apps. "The files are stored in private sandboxes and can be manipulated with the HTML5 File API and FileSystem API." With Google switching from WebKit to Blink for its layout rendering engine to improve its browser even further, Chrome may remain the most popular for quite some time.